GREG SORBER/JOURNAL Spaghetti Squash Tamales with roasted squash seeds and green chile apple puree were the creation that came out of Chef Sean Sinclair’s Farm & Table kitchen, based on the bounty of a fall harvest. 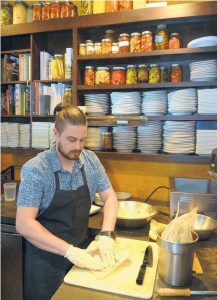 In mid-September, chef Sean Sinclair of Farm & Table wasn’t quite sure what the final recipe for his upcoming Spaghetti Squash Tamales would be. Hard squash were not off the vine yet, and the late summer harvest was still keeping him busy. But by mid-October, things at the farm and restaurant were looking quite different. Peppers were no longer being delivered by the truckload, and okra and eggplant had just finished for the season. And that meant Sinclair had time — and motivation — to pull together the perfect tamale recipe. “I’ve tried a lot of tamales, but I always come back to my grandmother’s recipe,” says Sinclair, a native of Tijeras. Watching Sinclair prepare them was a lesson in simplicity. 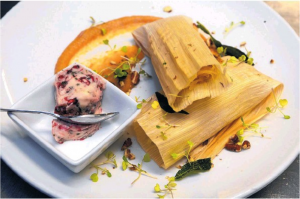 “Tamales don’t have to be an elaborate process. It takes more time if you’re cooking pork and chicken and making red chile sauce, but this is easy,” says Sinclair, who knows how to provide center stage for seasonal vegetables. Chef Sean Sinclair of Farm & Table says he’s a big supporter of local food because “it supports farms & farmers, but it’s also what food should taste like.” Here, he prepares spaghetti squash tamales. 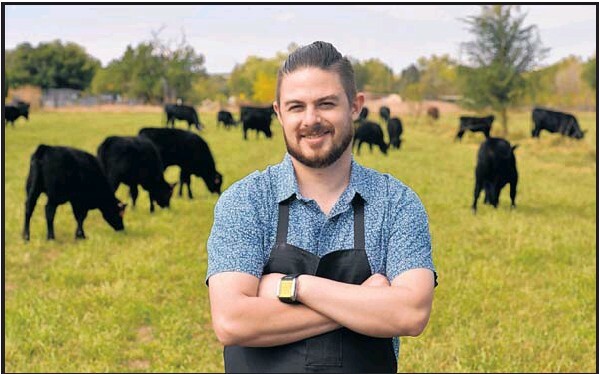 Farm & Table restaurant in Albuquerque’s North Valley began serving up seasonal, sustainable food in March 2012, and now 80 percent of the menu is sourced locally. Sinclair joined the Farm & Table team in October 2013. Training at Le Cordon Bleu of Culinary Arts in Portland, and having worked as a chef in über-local supportive Portland, Sinclair was no stranger to buying carrots grown around the corner. 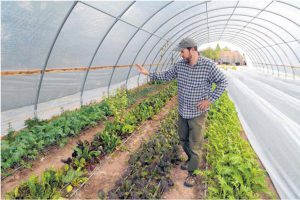 But now he has access to what many locavore restaurants only dream about: an on-premise farm with more than one-half acre of vegetables plus 3,000 square feet of covered hoop house. If that’s not enough, there are also 42 head of American Black and Red Angus cattle roaming on the back 14, enjoying their alfalfa. This bucolic setup is thanks to restaurant owner Cherie Montoya Austin and her father, David Montoya, who decided to buy land more than a decade ago to preserve agriculture in the North Valley where the family has lived for years. Montoya is a rancher, and he takes loving care of the cattle. It’s remarkable to see the cattle out back and remember that every cow only provides two tenderloins, two rib-eyes, two strip loins and two sirloins, which are usually featured Friday nights. The rest is ground. When Sinclair is not serving Farm & Table’s own meat, the restaurant almost exclusively serves other New Mexico-raised beef. Rick Murphy, owner and manager of Sol Harvest Farm, inspects produce in the 3,000-square-foot hoop house that provides vegetables for Farm & Table. Menu planning is one of the most challenging aspects for restaurants that are closely tied to the land, and that is true even when the farm is right outside your door. Sol Harvest Farm (the on-site farm leased to farmer Ric Murphy) provides a large percentage of what is served, but Sinclair also buys from an additional five to seven farmers every week, plus purveyors of cheese, nuts, mushrooms, beer and more. “We probably buy from 100 people in New Mexico, and I talk to my farmers all the time. They tell me what they have and what is happening in the field. One week I might get a hundred pounds of peppers, then the next week it’s 70 pounds, then it’s 50 pounds, and when it gets to 25 pounds, I know the season is over,” Sinclair says. By November, Sinclair has put away some of the best harvest by pickling, dehydrating, preserving and/or freezing. It’s clear Sinclair is a man who is at home with the food he is sourcing and preparing. “We are representing a modern version of New Mexican cuisine, and it’s not just beans and chile,” he says. “Local is important because it supports farms and farmers, but it’s also what food should taste like,” he explains. That’s why local melons, chile, kale, chard, greens, garlic, leeks, onions, corn, eggplants, squash, carrots and more are standard fare at Farm & Table. Does all of this local, organic food cost more? The short answer is yes, but nothing on the menu is extravagant. “We probably spend four to six times more for local food, but we utilize absolutely everything. Root peels make stock and soup, and we use whole animals. We have very little waste, and that helps with overall costs,” Sinclair says. Chef Sean Sinclair stands in a field at Sol Harvest Farm, the on-site farm just outside Farm & Table restaurant in the North Valley. Tamales are often made for the holidays, and Sinclair’s version might just become your new family favorite. They’re delicious and festive, and if you make them like Sinclair, they’ll be filled not only with masa and spaghetti squash, but also with love. These seasonal tamales feature sweet and healthy spaghetti squash. The compound butter and green chile apple puree give them an extra special flavor. Sinclair doesn’t recommend freezing tamales, but if this recipe makes more than you desire, they can be frozen. Or, refrigerate the masa for up to a week and make a second batch later. Recipe courtesy of chef Sean Sinclair of Farm & Table Restaurant in Albuquerque, NM. Originally published in the Albuquerque Journal November 19, 2014.